Payout every Thursday, 90% of Waves +10,000 WGO. In order to make people move their leases we do not payout MRT. Greetings, WavesGo, why your site is so poor? Do you have a plan of any updates? My question is here because you’re the top node, a waves showcase. Personally i was afraid of the platform before understood that your site is not an official one. I agree that the website is currently not in best shape. Yes, there are plans to update the website. Due to a lack of manpower it’s not first priority but it will get a complete revamp in the future. Could you include the leasing address in the information post please? I don’t think they want more people leasing to them since they already are the biggest node and want to scale down for network security and decentralization. @kimbimlim We are not really happy and satisfied with you node and distribution model. Do you think its enough. 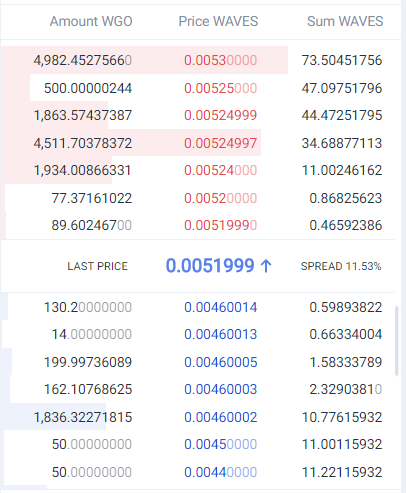 Even You are giving your own token WavesGo which is already having a spread of more than 11.53%. So means No profit at All from this Node for leassors. We would like to come with our own node soon and better services hopefully soon. We are distributing 90% of the collected Waves fees as well as 10k WGO every week. In recent weeks, the transaction fees have been significantly lower due to a decline in transaction volume. Please be aware that these numbers are not under our influence. Unfortunately, I do not understand what that means and why MRT are not paid out. I might cancel the lease to get MRT elsewhere. Otherwise, the payments work smoothly. Only the faucet has not been working for some time. Hi kimbimlim!!! Are you planning on updating the WaveGo site? I understand that there is a lack of manpower and resources. I am not a developer or a programmer, but I have some ideas about what can be added to your site and this is quite promising. If interested, then I can describe this idea. And then you decide to make it a reality or not. Please send me a DM with your ideas, would love to hear it.